Riding Live prompts participants to ride a bicycle to control their journey through an immersive landscape. It aims to encourage the growth and recognition of bike culture. 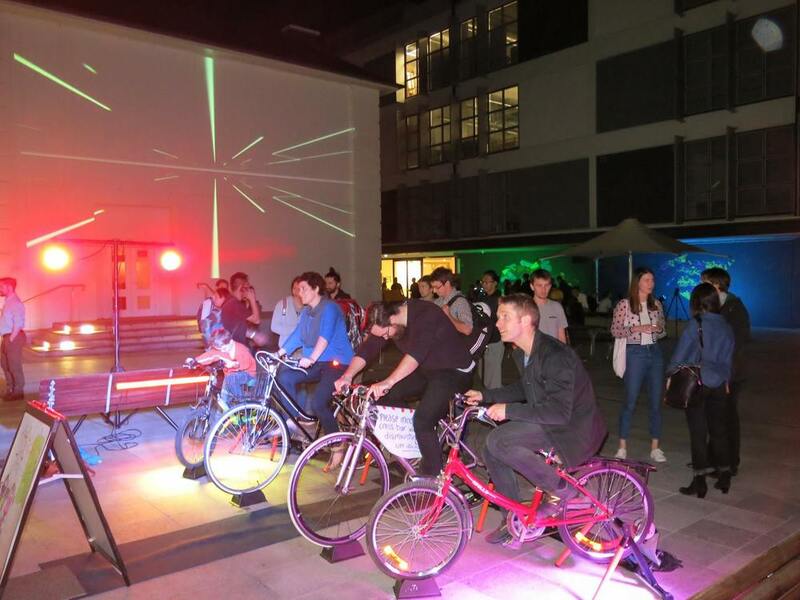 It was hosted at the Bespoke City Festival in October 2015 at UNSW Art and Design preceding the Sydney Rides Festival. 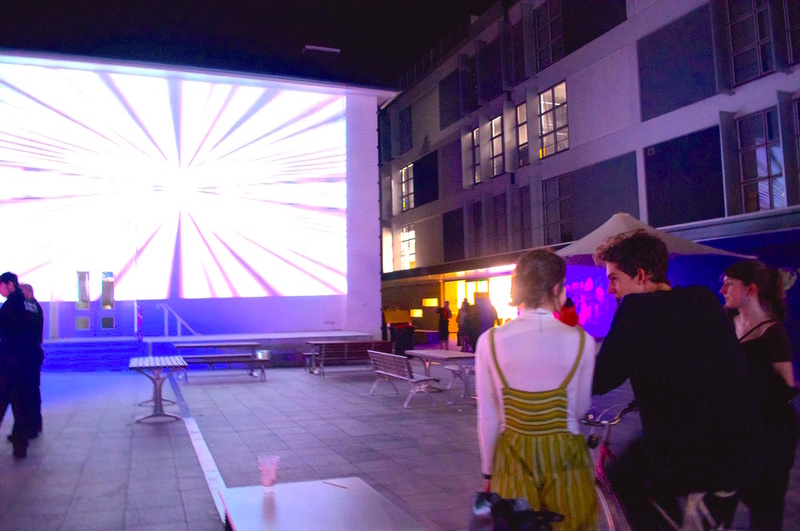 The installation was projected onto a 12m x 8m (1000 sq ft) wall overlooking the central courtyard, a courtyard filled with riding-centric artistic works across an approximate 830 sqm (9000 sq ft) area. This humungous scale allows the installation to transport people to an other-worldly experience. 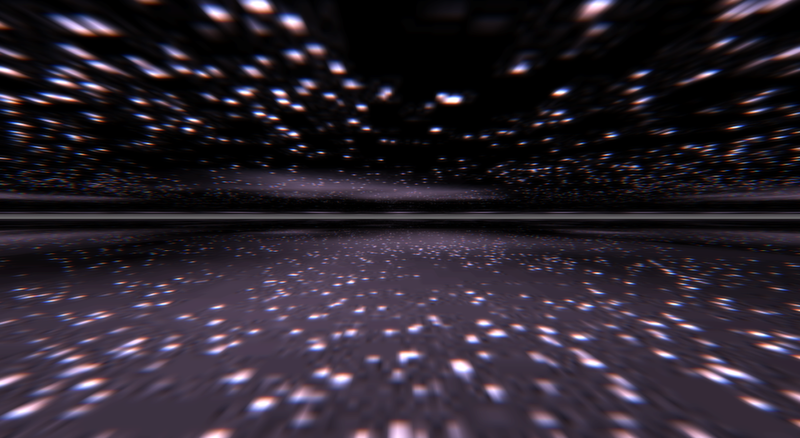 Abstract zooming visuals were created in Processing, and GLSL shaders, with procedurally generated textures and hand-painted textures using Photoshop. A festival-friendly bike was stood up and its revolutions were detected via an Arduino-connected reed sensor. A projected serendipitous data visualisation of real-time cyclists was the initial idea. After a bit of data analysis and visual prototypes in Cinema4D and After Effects, it was concluded that this was too passive for such an energetic festival. So the concept was rapidly pivoted to an interactive work using Space Odyssey-like zooming visuals. Hardware and bike gear had to be selectively sourced for the best riding experience. I've blogged a detailed writeup of the process. The overall sentiment was very positive. Learnings include empowering users further with a greater sense of control (e.g. through steering and in depth procedural generation). Very fun to create and ride. Riding Live was created with the help of Xavier Ho (fantastic advisor and GLSL supporter) and Laura Fisher (amazing festival director and artistic guide). Many thanks also to Andrew Kurniawan and Eugenius Lai for their assistance sourcing materials and with setup.